The Reno-Tahoe Odyssey Relay Run Adventure (RTO) is a relay from Reno to Lake Tahoe and back to Reno making a large 178 mile loop around the Reno-Tahoe region. 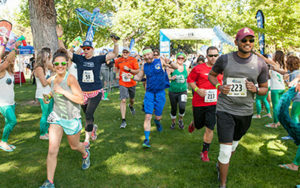 The relay starts at Wingfield Park along the Truckee River in downtown Reno, passes through Truckee, Tahoe City, South Lake Tahoe, Genoa, Carson City and Virginia City before returning to Reno and finishing at Idlewild Park. The date of the RTO is always the Friday and Saturday following Memorial Day Weekend. That means that the RTO is usually in late May or early June depending on the date of Memorial Day Monday. Teams start on RTO Friday, run throughout the night and finish the next day on RTO Saturday. Start times are staggered between 7 a.m. and 4 p.m. on RTO Friday depending on your team’s projected total time to complete this relay. The slowest teams start early that morning, and the fastest teams start later that afternoon. The maximum number of runners that you may have on an RTO team is twelve (12). The relay is ideally suited for 12 person teams with each person running 3 legs. Ultra teams of six (6) or less persons are allowed. You set up your runner line-up for your team. You should run in the order of your line-up. Race178 does not need to receive your line-up. The first year of the RTO was 2005. There were 36 teams and about 400 runners. In 2012, the 8th year of the event, we decided to cap the field at 3,000 runners, which is about 250 to 260 teams depending on how many ultra teams are in the field. Since then the RTO has sold out every year. This is the most fun you will have running on a spectacular route showcasing the beauty and history of the Reno-Tahoe region. For Most Runners This Event Is All About Having A Blast. Not everyone may be a competitive runner. But everyone must have fun. To that end, prizes are awarded to the most spirited team, the team with the “best” team name, the team with the “best” custom made shirts, and the team with the “best” decorated team vehicles. And don’t forget to vote for the Most Spirited Exchange Point. Many volunteers throw their own themed parties at the exchange points. This contest between exchange points adds to the fun experience that runners enjoy when they participate in the Reno-Tahoe Odyssey.